The year was 1915. Equipment and food supplies were totally inadequate. After battling its way for six weeks through thousands of miles of pack ice and located only a day's sail from its destination, the Endurance became locked inside an island of ice. Yet Ernest Shackleton enabled all 27 of his men to survive for over a year on the ice-bound Antarctic seas - leadership without equal. This gripping account is based on contemporaneous diaries and interviews conducted by the author with these exceptional men. ©1959 Alfred Lansing (P)2000 by The Audio Partners Publishing Corp. I truly enjoy reading the remarkable tales of unsung heroes in this world. Ernest Shackleton is one of them. Start to finish, this book kept me thinking, waiting, and imagining like few books ever have. Forget reality shows, forget mysteries... This book is a dose of "true reality and courage". Absolutely Fabulous!! This must be the most incredible human survival story ever. A great tale. Probably the best Audible book I've ever bought. I found myself unable to get out of the car because I wanted to get to the next "page". The actual hardcover book does have some wonderful pictures and maps which make the story even better, but the Audible version was great nonetheless. This incredible story should be heard in all its detail. This version is good; the unabridged one is phenomenal. Another reviewer commented that this story was the Apollo 13 of its time. That is a perfect description. Beyond that, there are lots of leadership lessons one can take from "watching" Ernest Shackleton lead a group through a prolonged and difficult time. As the story is told, he maintained leadership and vision in extraordinary times. An extraordinary story, compellingly told. I found myself coming home from work and still listening in the driveway, riveted by the endless string of seemingly impossible challenges these brave explorers had to overcome. All of this without the benefit of radios, electricity and the like, to say nothing of a "Mission Control" to guide them. If you have any appreciation for the strength and nobility of the human spirit and will, you will enjoy this book. I had heard in general terms about this adventure gone bad. But the actual events as depicted through this book which is based on the actual diaries of the members and crew of the Endurance are truly remarkable. The narration is well done. Listening to this actually made me purchase other books on the subject. wow what a great story on perseverance and leadership. the story was captivating from start to finish. very detailed. great story and an interesting read. it took turn after turn after turn. each nee thing that happens you think people are going to die. Certainly one of the most incredible stories of human survival and endurance in history. You will constantly be amazed at how this Ill-fated Antarctic expedition refused to quit in the face of all the fierce obstacles in the harshest conditions on Earth. 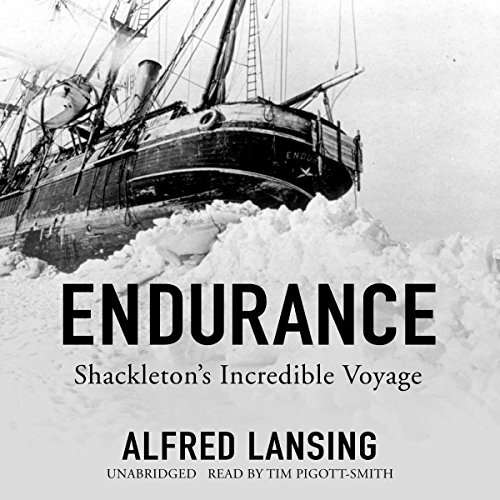 So, I have always found Shackleton and other explorers compelling, and I will probably get the e-book version, but the narration here doesn't work for me, and I do love Tim Pigott-Smith. So what went wrong? I wonder if actors like Tim Pigott-Smith should do audio narrations? I love him on film and I'm shocked that I can't stand his narration. The whole point of this story is that it is, in its very essence, exciting! Compelling! Pigott-Smith "acts" the whole thing. It doesn't need acting! It just needs telling! Please, just tell me the story. The writing sells it. The writing tells me what the landscape, the ice (of course, the main character here) is doing, the characters, the narrative! I don't need anyone to make it "exciting!" I don't need to be sold on what is at stake! What a shame. Pigott-Smith, you are a great actor, and I love you, but scale it back, please! Your voice is more than adequate. No acting required. Thanks.